OAKLAND, Calif. (KGO) -- Two months after the Golden State Warriors brought home a championship victory, Steph Curry says he is still enjoying the spoils of success. 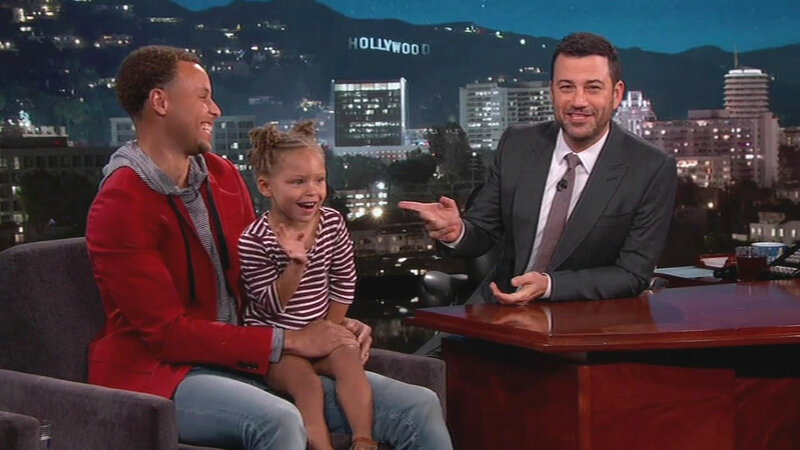 The NBA MVP stopped by Jimmy Kimmel Live on ABC7 Tuesday night. Curry says it's been a whirlwind and life is different. He notes that people recognize him on the street and says it's been a great journey. He says he was lucky enough to get a chance to play golf with President Barack Obama. Of course, the attention quickly turned to his daughter, Riley. As usual, the 3-year-old stole the show and got a huge round of applause from the audience. You can catch Jimmy Kimmel Live weeknights at 11:35 p.m. on ABC7. If you missed the show, you can catch the clips here. See video highlights and relive the Warriors' NBA Championship celebration here. And click here for full coverage on the Warriors.